The Center for Social Advancement, Medical Prevention and Research, "Panagia Philanthropini"
Help save a life by supporting Panagia Philanthropini’s cancer screening program. Allot can be done with a very little. Giving is a blessing and joy for the person who gives. Download and distribute this specially developed pamphlet. X Ray film and developing chemicals necessary for mammography were donated by International Orthodox Christian Charities (IOCC) to the Ormylia Foundation, Center of Panagia Philanthropini for use in it’s breast cancer early detection services to underprivileged and vulnerable women. Fervent advocacy and awareness raising took place for months by Judge William Nicholas and other sensitized members of Holy Trinity Greek Orthodox Church in Wilmington Delaware for the support of the work done by the monastery of Ormylia medical center. A “friend raising” and fund raising event took place at the Parish during Great Lent where IOCC Development Officer, Mr. Louis A. Zagami and Dr. Maureen George, from the University of Pennsylvania School of Nursing presented work being done at the Center in Ormylia. At this successful event funds were raised by the faithful of the community for support of the Ormylia women’s health program. This invaluable donation will help Panagia Philanthropini provide mammography to women who do not have the resources or access to breast care. This IOCC, U Penn, Holy Trinity Church and Ormylia partnership demonstrates in action what love and goodwill can accomplish. *Mammography is the proven first line of defense against breast cancer. Where organized screening is systematically implemented the 5 year survival rate of breast cancer patients detected during pre-symptomatic screening is as high as 95%. Professor Philip Kivitz, Senior Inspector for the MQSA program in the USA wrote a most pertinent letter to the New York Times regarding breast care in Africa. In 2007 Professor Kivitz honored the Center's work by organizing the faculty for a training workshop sponsored by Susan G. Komen for the Cure in Nairobi Kenya. The training of 50 practitioners was also sponsored by the American College of Radiology, with the Associate Director, Ms. Pam Wilcox participating. Together with Professor Kivitz and Ms. Wilcox faculty from Harvard and Karolinska shared their experience with the participants. Dr. Charles Kanakis, Jr., M.D., F.A.C.C., Vice President of Medical Affairs of Hellenicare visited the Center of Panagia Philanthropini . While at the Center, Dr. Kanakis toured the clinic facilities, met with the administrative and medical staff, and also visited with researchers of the Diagnostic Laboratory for Byzantine Art. After sharing with the staff of the Center the important work that Hellenicare is doing in its clinics in Armenia, Georgia and Ukraine, Dr. Kanakis and the Ormylia team discussed possible future collaboration in the context of the shared goals of serving fellow human beings in need. 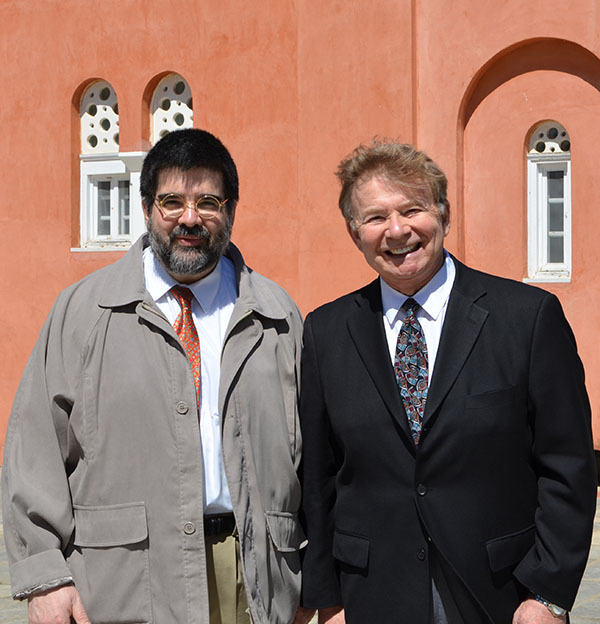 The Ormylia Foundation was honored deeply by Dr. Kanakis’ visit and inspired by his tireless efforts together with Mr. Andrew Athens of blessed memory for Hellenes and Orthodox Christians around the world. Dr. Charles Kanakis, Jr. is a leading cardiologist in the Chicago metropolitan area having been in private practice since 1980. He is a graduate of Northwestern University and the University of Illinois College of Medicine where he received his medical degree in 1969. He completed his fellowship in Cardiology at the University of Illinois Medical Center. Dr. Kanakis has been part of the teaching staff at the Abraham Lincoln School of Medicine since 1970 as is currently Clinical Assistant Professor of Medicine. In 1975 he won the Golden Apple Award for Excellence in Teaching. Dr. Kanakis is currently an attending physician at Lutheran General Hospital in Park Ridge, Illinois and Rush North Shore Medical Center in Skokie, Illinois. He is a Colonel in the United States Army National Guard as a State Surgeon. Dr. Kanakis has licensure and certifications in the State of Illinois and State of California as well as from the American Board of Internal Medicines with subspecialty certifications in Cardiovascular Disease and Interventional Cardiology. His is also the Honorary Consul of Cyprus in Chicago. As Vice President of Medical Affairs, Dr. Kanakis oversees hellenicare’s medical programs working closely with Dr. Roland Stamatov, Regional Medical Director. His extensive experience in models of community based health care have enabled hellenicare to develop an efficient and effective outpatient model of delivery health care services, particularly in rural areas."